ClearTax GST offers the most powerful and Advanced Reconciliation Tool that comes packed with 5X faster GST reconciliation and intelligence to auto-identify, match entries and assure 100% ITC claim. What to reconcile under GST? Why is it important to reconcile under GST? 1. What to reconcile under GST? GST reconciliation primarily involves matching the data uploaded by the suppliers with those of the recipient’s purchase data. This basically includes comparing the GSTR -2A auto-populated from suppliers data and the purchase data recorded by the receiver of the supplies. This matching concept also ensures that all the transactions which took place in a particular period have been recorded. 2. Why is it important to reconcile under GST? a. Under new GST returns, the taxpayers will only be able to claim ITC if the particular invoice is present in the GSTR 2A or supplier’s data. This requirement forces the businesses to reconcile and claim ITC correctly. b. Sometimes, it happens that vendor has declared his GST liability and credit has not been availed by the purchaser in his GST returns. So, not to lose the claim of ITC, the data should be reconciled on a regular basis. This reconciliation process will ensure no ITC loss on any invoices. c. To avoid any duplication, taxpayers must consolidate and reconcile the values. This will ensure correct declaration and maximize the credit of input taxes. a. Login to ClearTax GST and click on the “Reconciliation” tab. b. After clicking on the reconciliation tab, below screen appears. Select the financial year and the tax period you want to reconcile for. c. Download GSTR-2A from GSTN for all periods in one go. e. Then, click on “Start Reconciliation”, the process of match and reconcile will start. A consolidated invoice data appears supplier wise in the next screen. 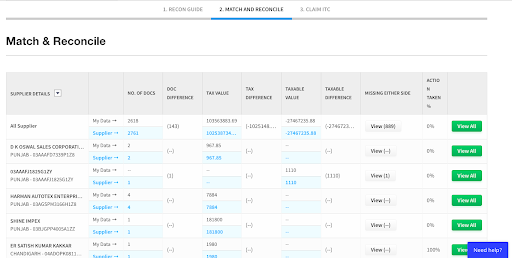 After matching and reconciling, the status of each and every invoice as Reconciled or not is shown under column “Recon Status”. g. Apply filter on “Reconciliation Status” to view all the results appearing in “Recon Status” tab. 1. Matched: Here, purchase invoices uploaded and GSTR-2A data downloaded from the GSTN portal matches based on default and suggestions from ClearTax. 2. Mismatch in values: Here, purchase invoices uploaded and GSTR-2A data downloaded from the GSTN portal doesn’t match in one go. 3. Missing in my data: Here, purchase invoice in not uploaded but the same appears in the GSTR 2A downloaded from GSTN portal. 4. 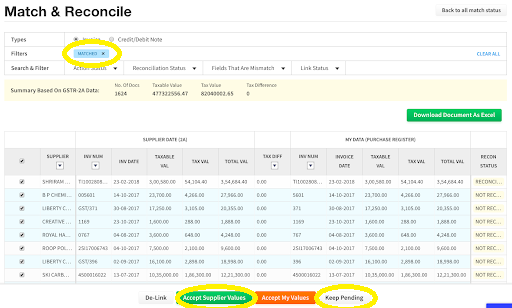 Missing in Supplier Data: Here, purchase invoice is uploaded but the same is not present in the GSTR 2A downloaded from GSTN portal. 1. De-link: The linked invoices can be de-linked. Once de-linked, invoice falls in either “Missing In My Data” or “Missing In Supplier Data” depending upon which bucket they belong to. 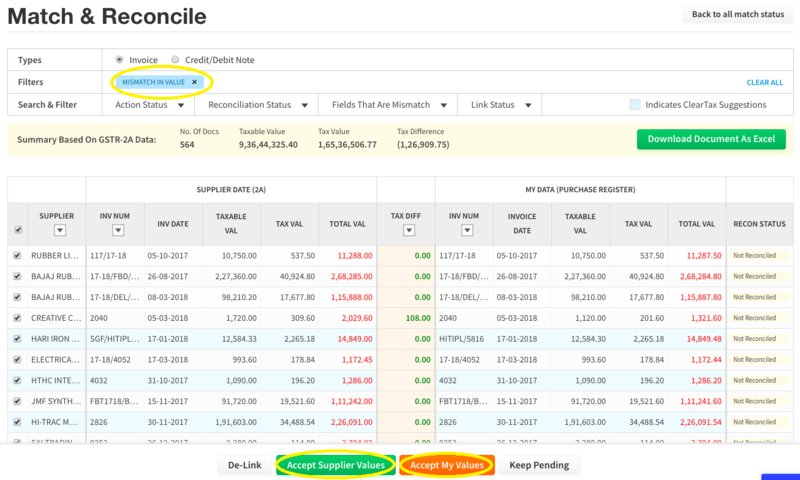 Note: If you have bulk selected invoices from multiple buckets, you would not be able to de-link invoices for either “Missing In My Data” or “Missing In Supplier Data”. 2. Accept supplier values: Accept the values uploaded by the supplier to claim ITC on the selected invoices. 3. Accept my values: Accept your own values to claim ITC on the selected invoices. 4. Keep pending: Once the invoice is marked as ‘Keep pending’, the same will not be available for ITC in a particular month. 5. Link Invoices: You can suggest invoices that you want to link to a respective document. In case an invoice has to be de-linked, it will shift to Missing in Supplier data or Missing in my data respectively. a. Accept supplier values or Accept my values, in case of Mismatch in values when the tax difference is very low respectively. b. Keep pending, in case one not wants to claim ITC of that particular invoice. c. De-link invoices first and then link it to different invoice in case of exact values tallies. a. Accept supplier values, when the supplier has uploaded the correct invoices. b. Link Invoices which are present in GSTR 2A with the suggested purchases from the respective suppliers. a. Accept my values, when you have uploaded the correct invoices. 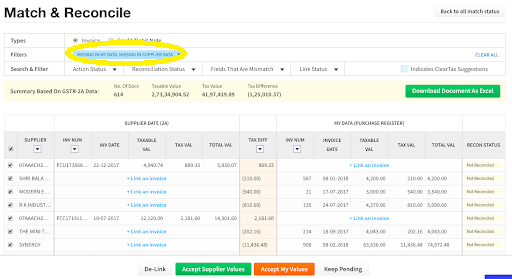 Further, Click on “+link an invoice” to link a particular unmatched invoice with the suggested invoices with the respective supplier.